Banzai Vapors Coupon Code! 20% Off All E-Liquid! - Daily Vaping Deals & The Best Vape Product Reviews at Vaping Cheap! Home → Coupon Codes → Banzai Vapors Coupon Code! 20% Off All E-Liquid! Banzai Vapors Coupon Code! 20% Off All E-Liquid! You can now save 20% off all e-liquid at Banzai Vapors right here by using our exclusive coupon code “VapingCheap“! International shipping is available! 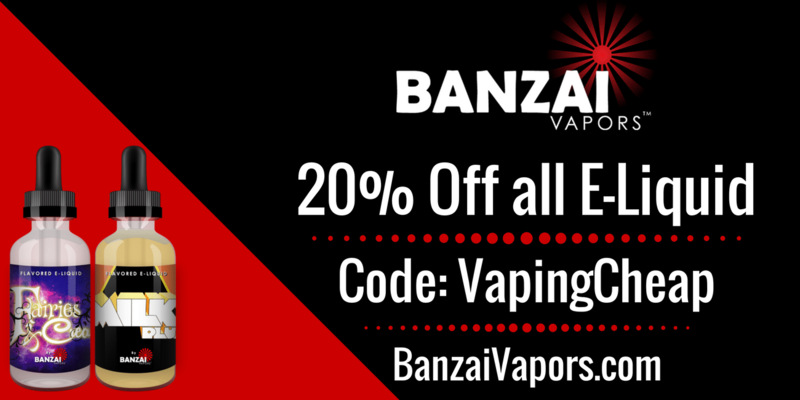 With our exclusive Banzai Vapors Coupon Code, you can save 20% off all e-liquid! Banzai Vapors have a ton of different flavors to choose from on their website, so no matter what you’re favorite flavor profile is, I’m sure you’ll find it here! In addition, they have multiple bottle sizes available, so you can stock up on some of your favorites! Also, Banzai Vapors offer nicotine strengths up to 12mg, which is perfect if you prefer higher nicotine strengths and mouth to lung vaping! If you’re looking to save on some of your favorites at Banzai Vapors or looking to try some new premium e-juice at a discount, then this is a perfect coupon code to do so! Be sure to check out Banzai Vapors, where you can save 20% off all e-liquid!